CPO or Chief Procurement Officer is one among the top executives of the company who leads procurement department and is responsible for administration, management as well as supervision of organization’s acquisition process. Their role also includes managing the acquisition of supplies, materials, and equipment. They ensure that purchases will satisfy the needs of the company while reducing costs and giving higher profit margins. To target CPO’s of several organizations, buy Blue Mail Media’s CPO Mailing List that guarantees more than 90% deliverability rate. We provide the most accurate and highly reliable list that complies with GDPR and Anti-Spam law. Also, our team gathers the data from multiple trustworthy resources such as yellow pages, surveys, business directories, government records, and more. Hence you can use our list and reach the right targets with no worries of settling in spam. 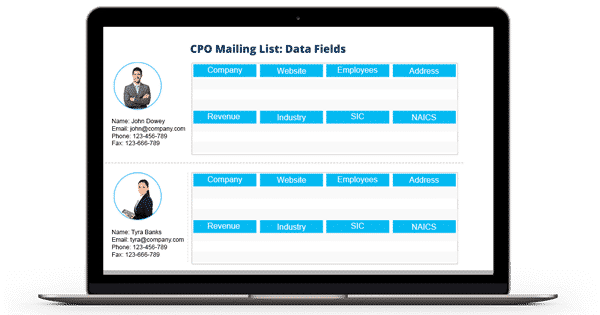 Blue Mail Media, a well-known data solution provider, offers you the best CPO Executives Mailing List that lets you meet your target CPO all over the globe. You can interact with them regardless of boundary constraints. Our list covers the details of professionals residing in several regions such as USA, UK, Europe, Russia, Africa, North America, South America, Asia, and others. Besides, we provide the list in both pre-packaged and customized format that helps you to meet your business requirements. With the help of this customization option, you can reach the right prospects at the right time quickly. Our list is free from errors and redundancies. Our team achieves this by updating it on a regular basis. They put significant efforts as well as time to keep our CPO Email Database fresh and clean. They make verification calls and sends verification emails to identify the inaccurate data and later scrub it to provide you the most current data. Most of the organizations have already reaped good profit with the help of our CPO List. Avail our list now and be one among them. We guarantee you that you can see positive remarks in your sales ratio in less time. Call us at 1-888-494-0588 or drop an email to sales@bluemailmedia.com if you have any clarifications! We are always happy to help you. Our team of data scientists, analysts, and experts constantly dig out the most qualitative data to power your multi-channel marketing strategies. Also, we ensure that our List of CPO Email Addresses remains accurate and updated by making thousands of verification calls each day and sending out verification emails.